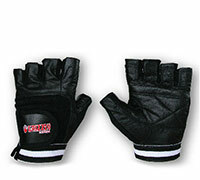 Soft, Durable Cowhide Leather with stretch Back, Padded Palms and Fingers. Reinforced Stitched Stress areas. Velcro® closure and Unisex Design.